"We must observe also, that among the heathen the names of poor men are more likely to be known than of rich. Now our Lord mentions the name of the poor, but not the name of the rich, because God knows and approves the humble, but not the proud." 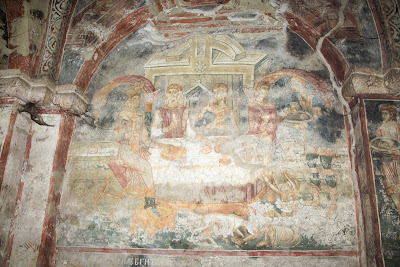 "Lazarus is interpreted, "one who was assisted." For he was poor, and the Lord helped him. "This discourse concerning the rich man and Lazarus was written after the manner of a comparison in a parable, to declare that they who abound in earthly riches, unless they will relieve the necessities of the poor, shall meet with a heavy condemnation. But the tradition of the Jews relates that there was at that time in Jerusalem a certain Lazarus who was afflicted with extreme poverty and sickness, whom our Lord remembering, introduces him into the example for the sake of adding greater point to His words." But the insolence and pride of the wealthy is manifested afterwards by the clearest tokens, for it follows, and no one gave to him. For so unmindful are they of the condition of mankind, that as if placed above nature they derive from the wretchedness of the poor an incitement to their own pleasure, they laugh at the destitute, they mock the needy, and rob those whom they ought to pity." "Now if the wearing of fine and precious robes were not a fault, word of God would never have so carefully expressed this. For no one seeks costly garments except for vainglory, that he may seem more honorable than others; for no one wishes to be clothed with such, where he cannot be seen by others." "And here we must narrowly watch ourselves, seeing that banquets can scarcely be celebrated blamelessly, for almost always luxury accompanies feasting; and when the body is swallowed up in the delight of refreshing itself, the heart relaxes to empty joys." "But what means it, that when in torments he desires his tongue to be cooled, except that at his feasts having sinned in talking, now by the justice of retribution, his tongue was in fierce flame; for talkativeness is generally rife at the banquet. " "It may here be observed, that all who are offended by us are exposed to our view. But the rich man sees Lazarus not with any other righteous man, but in Abraham's bosom. For Abraham was full of love, but the man is convicted of cruelty. Abraham sitting before his door followed after those that passed by, and brought them into his house, the other turned away even them that abode within his gate." "He [the rich man] died then indeed in body, but his soul was dead before. For he did none of the works of the soul. All that warmth which issues from the love of our neighbor had fled, and he was more dead than his body. But no one is spoken of as having ministered to the rich man's burial as to that of Lazarus. Because when he lived pleasantly in the broad road, he had many busy flatterers; when he came to his end, all forsook him. For it simply follows, and was buried in hell. But his soul also when living was buried, enshrined in its body as it were in a tomb." "And here we must remark what fearful sufferings are heaped upon the rich man in flames. For in addition to his punishment, his knowledge and memory are preserved. He knew Lazarus whom he despised, he remembered his brethren whom he left. For that sinners in punishment may be still more punished, they both see the glory of those whom they had despised, and are harassed about the punishment of those whom they have unprofitably loved." 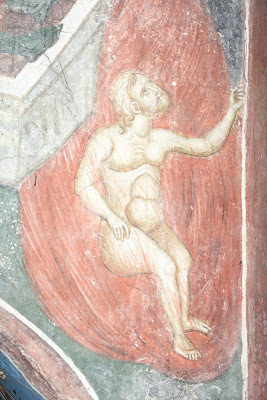 "All this then is said to Him because he chose the happiness of the world, and loved no other life but that in which he proudly boasted; but he says, Lazarus received evil things, because he knew that the perishableness of this life, its labors, sorrows, and sickness, are the penalty of sin, for we all die in Adam who by transgression was made liable to death." "He says, You received good things in your life, (as if your due;) as though he said, If you have done any good thing for which a reward might be due, you have received all things in that world, living luxuriously, abounding in riches, enjoying the pleasure of prosperous undertakings; but he if he committed any evil has received all, afflicted with poverty, hunger, and the depths of wretchedness. And each of you came hither naked; Lazarus indeed of sin, wherefore he receives his consolation; you of righteous wherefore you endure your inconsolable punishment; and hence it follows, But now he is comforted, and you are tormented. " "Whatsoever then you have well in this world, when you recollect to have done any thing good, be very fearful about it, lest the prosperity granted you be your recompense for the same good. And when you behold poor men doing any thing blameably, fear not, seeing that perhaps those whom the remains of the slightest iniquity defiles, the fire of honesty cleanses." "Whom does this rich man represent, this man so richly dressed, who enjoyed all those daily banquets? Is it not the Jewish people [or in another sense, hypocritical, false "Christians", for that matter], who made a cult of exterior things, using the delights of the law which they had received, for vain motives, not for true profit? And whom does Lazarus signify, covered in wounds, if not the Gentile peoples? These, when converted to God, were not ashamed to confess their sins, that is to say, they had many wounds and open sores. As when some infection comes from within the body to ulcers of the skin, so showing itself exteriorly, so when we confess our sins, it is in a sense an outbreak of our sores. In confession we manifest in a very profitable way the virus of sin which had concealed its venom within the soul. Exterior wounds bring to the surface the festering sore beneath, and when we confess our sins, we uncover this hidden sore. But the unfortunate Lazarus wished only to eat of the crumbs that fell from the rich man's table, and no one would give him any, because those proud people disdained to admit the Gentiles to the knowledge of their law. The following is an amateur translation of a "Paraklesis Canon to the Twelve Holy Unmercenaries: Kosmas and Damian, Cyrus and John, Panteleimon and Ermolaos, Sampson and Diomedes, Mokios and Aniketos, Thallelaios and Tryphon". I am unaware of who wrote this service, and when it was written. 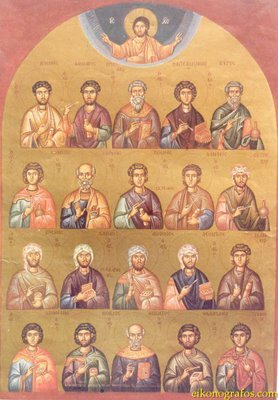 It should be noted that most Orthodox sources traditionally number at least twenty Unmercenary Physician Saints (two additional sets of Sts. Kosmas and Damian, Sts. 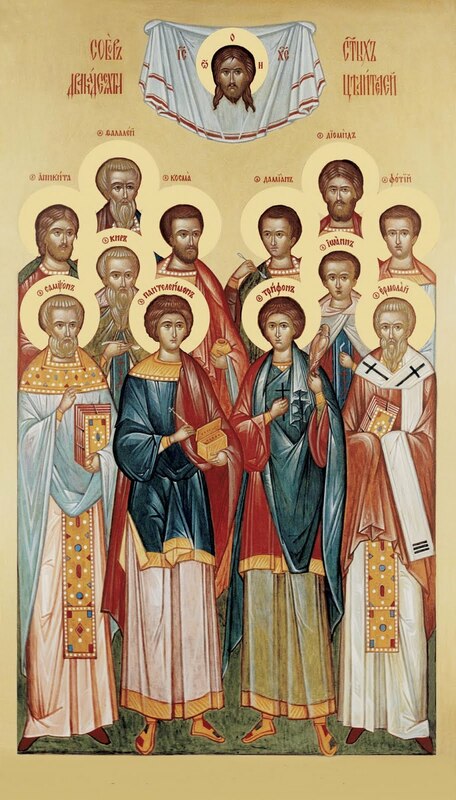 Eutropios, Leontios and Anthimos, and St. Julian of Emesa are missing from the above list). Please note that in the service below, any mention of twelve Unmercenaries I have replaced with the generic "Band" of the Holy Unmercenaries. According to the following site, the traditional feast of the Synaxis of the Holy Unmercenaries is celebrated in the Greek tradition on October 17th, for which a full service has been composed (in Greek): http://analogion.com/forum/showthread.php?t=15637. In honor of the upcoming feast of Sts. 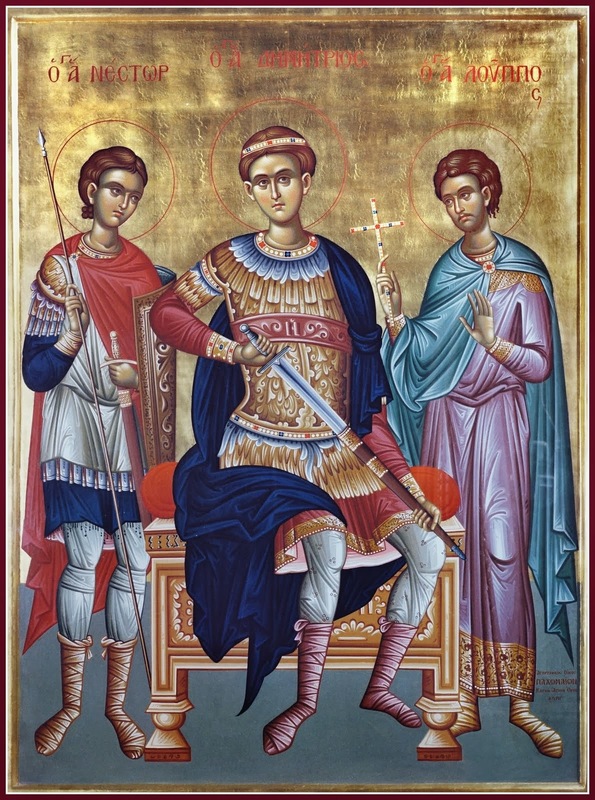 Kosmas and Damian the Unmercenaries of Asia Minor, I offer the following service. I request reviewing the translation before any public/liturgical use. Also note that the meter of this translation is not set to match the original music. May the compassionate and wonderworking Unmercenaries grant us all healing of soul and body, as they are imitators of Christ, the great Physician and Shepherd of His sheep! You who trample upon the basest pleasures, and freely heal sicknesses, O all-famed Unmercenaries and divine Physicians, you were crowned by Christ with heavenly crowns, therefore we entreat you to deliver us from the darkness of sin and illnesses, as you intercede with the God of all. Holy Unmercenaries and wonderworkers, visit our infirmities, freely you have received, freely give to us. To the Theotokos all hasten with longing, crying out with fervor, Most-holy All-hymned Lady, deliver through your mercy from unexpected dangers, all kinds of trials, and speedy destruction, and every illness, O Good one, blessed Mary, Bride-of-God. O Saints of God, intercede for us. Surrounded by endless dangers, I entreat you to look upon us warmly, that through your intercessions to God, you might speedily deliver us, O Unmercenaries. 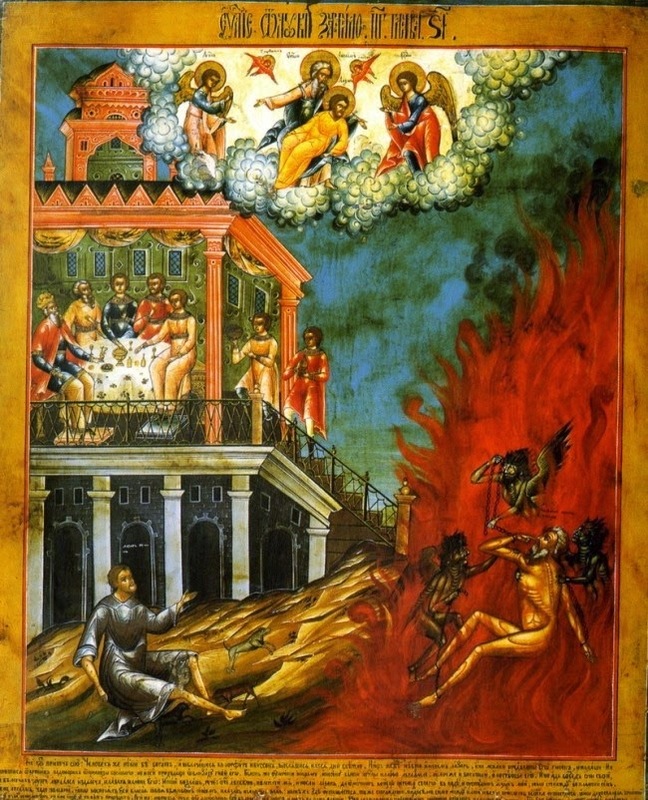 The terrible flame of the passions enflames my heart and soul, O divine Unmercenaries, speedily extinguish it, through your intercessions for us. A multitude of sicknesses and terrible passions, many from my sins, heal through your active medicine—your intercessions towards the Master—O Unmercenaries. Grant understanding to your servant, O Mariam, and open to me the gates of repentance, and deliver me, through your intercessions, from the gates of death-bearing sin, O Lady. Through your divine protection, O Unmercenaries, deliver me from the confusion and storms of life that swell about me, for I have found you, after God, as pilots towards the safe and unassailable harbor. I entreat with fervor that you heal the illnesses of my soul and the sicknesses of my flesh, for you, O All-sacred ones, imitated the All-wise Physician of souls and bodies. Terrible sicknesses and continuous passions each afflict me, O Unmercenaries, and through your fervent intercessions to the Lord, grant us soothing medicine. I wretchedly lie on my bed of pain, and I ask of you, O Virgin, to lend me your ear. Hasten to save me and to deliver me speedily, for now the fire consumes my heart. Look down, O [band] of holy Unmercenaries, upon my sicknesses of soul and body, and grant me healing, through your prayers. The burning of my passions, and the afflictions of my wretched soul, through your prayers, O Unmercenaries, extinguish speedily and drive them away. We ever receive graces from your Icon, O Unmercenaries, and we praise the Greatly-good One Who glorified you. I lie on my bed ill with sicknesses of soul and body. O Unmercenaries, raise me up, through your intercessions to the Savior. Grant me deliverance, O All-pure One, who have taken refuge in your intercessions, and every sickness and burden, thoroughly drive away straightaway. Speedily fill my soul with divine grace, O sacred [band] of Unmercenaries, and those who take refuge in your protection and your icon. Deliver me now through your prayers to the Lord from danger of sickness and every trial, O [band] of Physicians worthy to be praised. Heal the many passions of soul and body, O [band] of Physicians All-blessed, of those who venerate your Icon with longing. Every enemy which assails us, O All-pure One, make disappear for your servants through your divine power. Death and trials and all kinds of terrible tribulations and grave sicknesses you drive away, O free Physicians of the sick, for those who piously take refuge in you, O All-holy Ones. As an unassailable wall for those in dangers, we have found your icon, and from all kinds of dangers we are delivered, for we call you our redeemers and saviors after God, O most-famous divine Unmercenaries. I lie on the bed of my incurable passions, O divine Unmercenaries, I entreat your fervent protection and help, do not neglect to intercede ceaselessly, that I find health and aid. O Most-compassionate One who gave birth to God, O Virgin Mary Theotokos, through your endless intercessions to God, deliver me from trials, I who cry out to you and glorify you, O only Pure Lady, All-holy Bride-of-God. O Spotless one, who by a word did bring to us the Word eternal, in the last days ineffably, do you now plead with Him, as the one with the motherly favor. And the priest entones the ektenis. O fervant protectors and unsleeping watchmen, those who hymn you in faith cry out to you: O all-sacred defenders, hasten to deliver us from from dangers, for you have boldness towards the Lord. Verse: Hear this, all nations. The Saints who are on the earth, the Lord has shone wondrous. "At that time, Jesus called to him his twelve disciples and gave them authority over unclean spirits, to cast them out, and to heal every disease and every infirmity. These twelve Jesus sent out, charging them, "Go nowhere among the Gentiles, and enter no town of the Samaritans, but go rather to the lost sheep of the house of Israel. And preach as you go, saying, 'The kingdom of heaven is at hand.' Heal the sick, raise the dead, cleanse lepers, cast out demons. You received without paying, give without pay." Through the intercessions of the Unmercenaries, O Merciful One, blot out the multitude of my offenses. Both now and forever, and unto the ages of ages. Amen. Through the intercessions of the Theotokos, O Merciful One, blot out the multitude of my offenses. Verse: Have mercy upon me O God according to Your Mercy, and according to the abundance of Your compassion, blot out my transgressions. The transformation of all trials, and the deliverers from every sickness you are, O holy famed [band] of sacred Unmercenaries, save us all from the movements and influence and evil of the enemy, through your divine intercessions towards the Lord. Priest: "Save O God Your people..."
My grave illness, transform now into health, O Saints, and totally heal soul and body of those who cry to the Lord: O the God of our Fathers, blessed are You, O God. Desiring mercy, you preached Christ, O divine Unmercenaries, entreat Him to deliver from dangers those who cry: You Who are wondrous among Your Saints, blessed are You, O God. The healers of bodies and saviors of souls you are, and we entreat you to heal and to save those who cry to Christ, the Savior of all: O the God of our Fathers, blessed are You, O God. From the winter comes spring, and from confusion comes calmness, O Pure one, from the darkness of passions to the light of dispassion, and repentance proceeds, for those who fervently take refuge in you. Do not neglect those who seek your help, O divine Unmercenaries, but deliver from every sickness and danger. You drive away the many assaults of temptations, O Unmercenaries, through your fervent intercessions towards the Master. You were shown to be ready Healing of illnesses, O [band] of Unmercenaries, wise and truly wondrous. That I might honor you, I hymn with fervor your name most longed-for, O Mary, and speedily deliver me from sicknesses and dangers. The streams of my tears, you receive with joy, and through your intercessions you wash away all the filth of sicknesses, O Unmercenaries. Receiving eternal joy with the angels, O divine Unmercenaries, fill our hearts with endless joy. The honorable Icon of the wise Physicians has become a harbor and clinic for the sick, for those who hasten with faith are delivered from illnesses. Both now and for ever and unto the ages of ages. Amen. O Mary Theotokos, deliver the choir of the Faithful from visible and invisible foes, and save from all corruption, dangers and trials. Physicians of all the ailing, and spring of healings, O famed Unmercenaries, come let us hasten to them, O lovers of feasts, and worthily glorify them in hymns. Divine Unmercenaries, wonderworkers, Physicians of the sick, heal those who fervently call upon you, of many passions, through your intercessions towards the Lover-of-mankind. Do not cease to entreat the Holy Trinity, O Unmercenary Physicians of souls and bodies, to deliver from dangers, and every sickness and sadness. You are a spring of healings that flows ceaselessly with gifts from God, the all-bright treasuries of the uncreated light, the divine Unmercenaries let us praise. Come, those in all kinds of sickness, and those assailed by terrible dangers, let us hasten with longing to the haven of the divine Unmercenaries, and we will be saved. Tryphon, [Saints] Kosmas and Damian, with Thallelaios, and Mokios the wise ones, Sampson, Diomedes, with Cyrus, John, and Aniketos, let us praise. 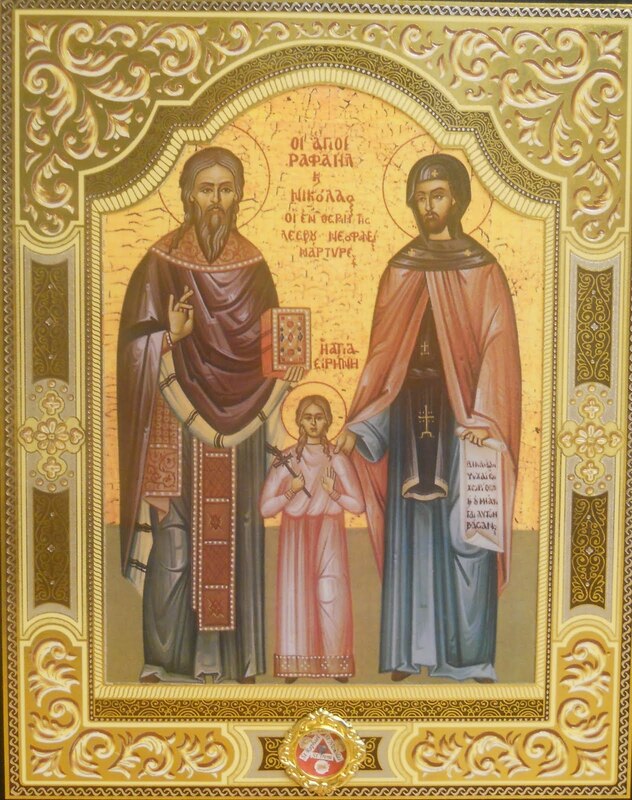 The noble Panteleimon, with his teacher, Ermolaos the wondrous, Julian the light of the Church, and the salvation of the faithful, let us honor in hymns. You impart deliverance alone for piety towards God, O most-holy band of Unmercenaries, in hymns of honor we praise you. With the hosts of Angels, God's messangers, with the Lord's Forerunner, and Apostles the chosen Twelve, with the Saints most holy, and with you the Theotokos, we seek intercession for our salvation. Come, O multitude of the Orthodox, come O choirs of the Faithful, let us embrace the all-sacred icon of the Unmercenaries of Christ, Physicians of our passions, and let us cry out to them: deliver us who honor you, O Unmercenaries, from dangers, sicknesses and incurable passions, through your prayers to the Creator, O All-honored ones. Lady, O do receive, from thy servants their many prayers, and deliver all of us, from all sadness and necessity. My numerous hopes are placed before you, O Most-holy one, Mother of our God, guide me with care within your sheltered arms. 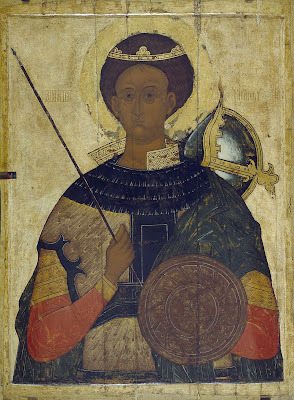 St. Savvas the Sanctified during his lifetime told his disciples that his incorrupt body would be removed from his monastery and later would rest in the Lavra, which he founded. He said this return of his relics would come before the end of the world. This prophecy was fulfilled when the holy relics of St. Savvas were stolen by the crusaders of the First Crusade (1096 - 1099) together with many other relics and brought to Venice, Italy where he was enshrined in a church dedicated to St. Anthony. Nearly nine centuries later his relics were returned to Israel. "The Pope did not give us the holy relic because he loved us, but because he [St. Savvas] would constantly appear to him [Pope John XXIII] and would bother him to have his relics returned to his monastery. When the Pope died he did not take the wishes of the Saint into account, so he appeared again to his successor [Pope Paul VI]. Even in the church where his holy relics were treasured in a glass coffin, he would hit the glass and cause trouble, frightening the guards and the Latin monks." Patriarch Benediktos had insisted that Fr. Seraphim attend the reception of the relics. He even told the Abbot: "In your days, Fr. Seraphim, Saint Savvas has returned!" Fr. Seraphim responded: "No, in your days, Your Holiness." A problem arose when it came time to dress the holy relics in Orthodox vestments, since the Latins had dressed him in Latin vestments. After nine centuries it would be impossible to manoeuvre the body so as to put on the rason, the monastic schema and epitrachelion among other things. To further complicate matters, the hands of St. Savvas were crossed over his chest. Metropolitan Kyriakos of Nazareth describes what then happened as follows: "We then saw Abbot Seraphim kneel before the holy relics and pray for a good amount of time. At one point he arose and did prostrations and lifted the arms of Saint Savvas as one would a living man before the amazed eyes of us all." They were able to change the vestments without a problem in Venice before the return to Jerusalem. When the holy relics finally arrived in Jerusalem it was first brought to the Church of the Resurrection for many days. Here the women could venerate the holy relics prior to being brought permanently to the all-male monastic Lavra of St. Savvas. Fr. Seraphim tells of a certain miracle at this time in Jerusalem. An Orthodox nun who was waiting to venerate the holy relics had doubts over whether or not the Latin's had indeed given the authentic relics to the Orthodox. 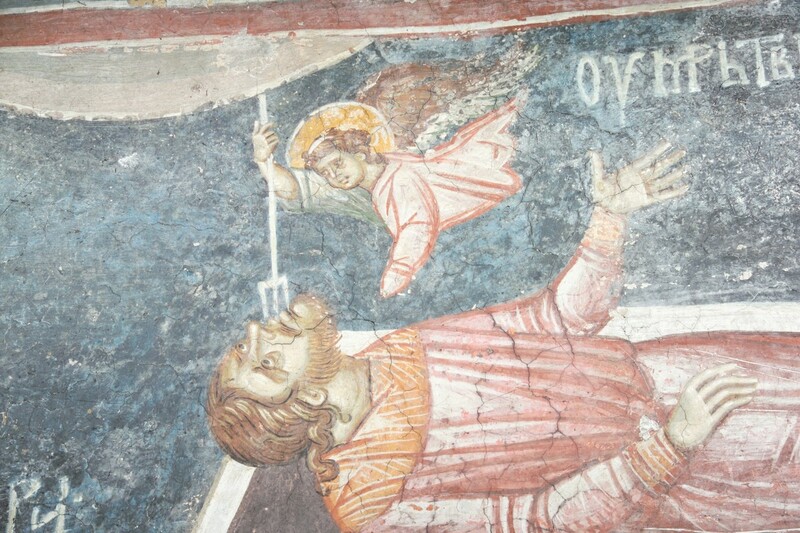 It was then that she saw the head of St. Savvas lift and turn to her, then it returned again in its place. Her joy removed all doubts. "On Wednesday October 25th 2011, in the Holy Lavra of St. Sabbas the Sanctified, in the desert of Judea, there was a great and radiant celebration of the 46th anniversary of the transferral of the holy and incorrupt body of St. Sabbas, from Venice. The feast and festival was presided over by the Blessed Patriarch of Jerusalem Theophilos. The vigil began on Tuesday evening at 9PM and ended Wednesday morning at 7AM. With the Patriarch also served the Archbishop of Konstantines Aristarchos and the Archbishop of Jordan Theophylaktos. The church was packed with a multitude of pilgrim priests, monks and laity from Greece (from Mount Athos, Fr. Antipas from Karyes chanted for the feast), from Cyprus, and from as far as Switzerland and France, along with many Arab Orthodox from the flock of the Greek Orthodox Patriarchate of Jerusalem from all around the Holy Land. The preparation and the hospitality was great of the tireless and chosen Fr. 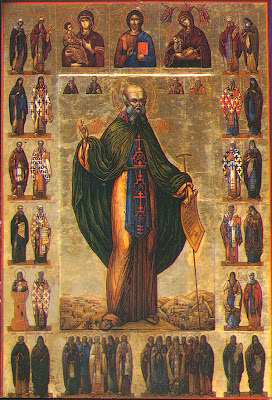 Evdokimos, the spiritual father of the Lavra, and that of all of the Sabbaite fathers. 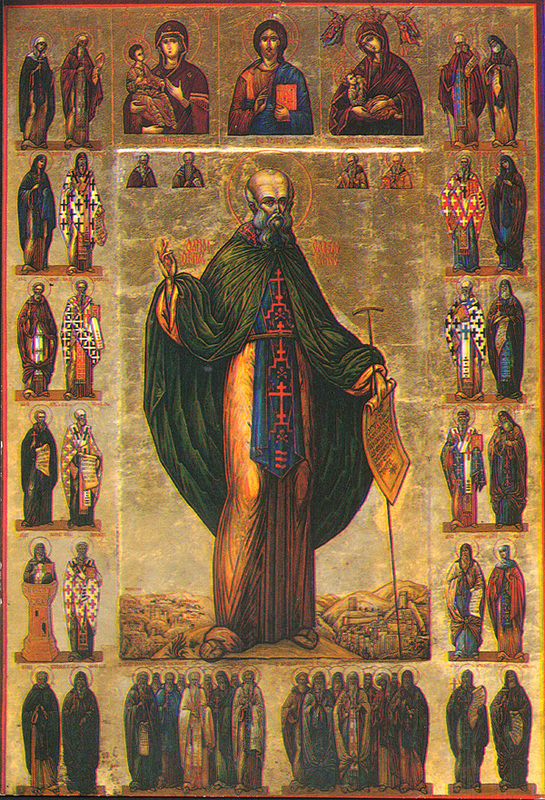 St. Sabbas the Sanctified was a great defender and proponent of our holy Orthodoxy. He worked a multitude of struggles, together with his friend, St. Theodosios the Cenobiarch, against heretics. St. Sabbas is a prototype for us today, and may we have his prayers and intercessions. He is seen also as the protector and helper of those who suffer from cancer, and of childless couples. A multitude of miracles and healings are recorded daily by the Sabbaite monks of the Jordanian desert, and by the Elder Evdokimos in the Holy Land." Archimandrite Ignatios is the Proistamenos of the Holy Monastery of the Shepherds in Bet Sachur, a dependency of the Holy Lavra of St. Sabbas the Sanctified. For the life of St. Sabbas and information about his Lavra, see: http://full-of-grace-and-truth.blogspot.com/2009/12/st-sabbas-sanctified-and-his-holy-lavra.html. 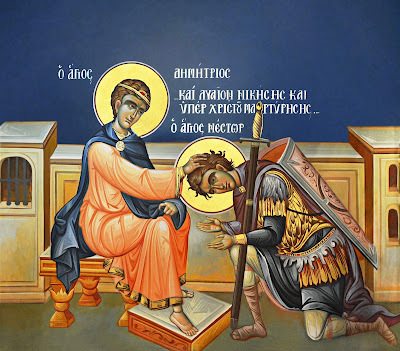 "There lived once an ascetic on the Mount of Solomon who, hearing of the reports of the holy myrrh [of St. Demetrios], had doubts, saying in his mind that there were many other great martyrs who suffered more than St. Demetrios, yet they were not honored by God in such a manner. And one night after he saw, as if in a dream, that he was in the Church of St. Demetrios and he met the man who had the keys to the tomb of the Saint, and he asked him to open it that he might venerate it. When he was kissing the shrine, he observed that it was wet with fragrant myrrh, and he said to the keeper, "Come, help me did that we might see from whence comes this holy myrrh." They dug, therefore, and came to a large marble slab which they removed with great difficulty, and immediately there appeared the body of the Saint, shining and fragrant, from which welled up abundant myrrh coming from the openings of his holy body made by the piercings of the lances. There flowed so much myrrh that both the keeper and the ascetic were drenched, and fearing to be drowned, the monk cried out, "Saint Demetrios, help!" Whereupon, he awoke from this vision and found himself to be drenched with the holy myrrh." St. Demetrios, according to sources, is called “Great-martyr”, “Lover of the City”, “Savior of the City”, and “Myrrh-streamer”. He is called Myrrh-streamer because he poured forth myrrh from his tomb, which was taken up by the faithful in vials made from glass, clay, or lead, called “koutrouvia”. The myrrh of the Saint is a miracle of God, and a great blessing of the Great-martyr to the faithful Christians who call upon his sleepless intercessions. 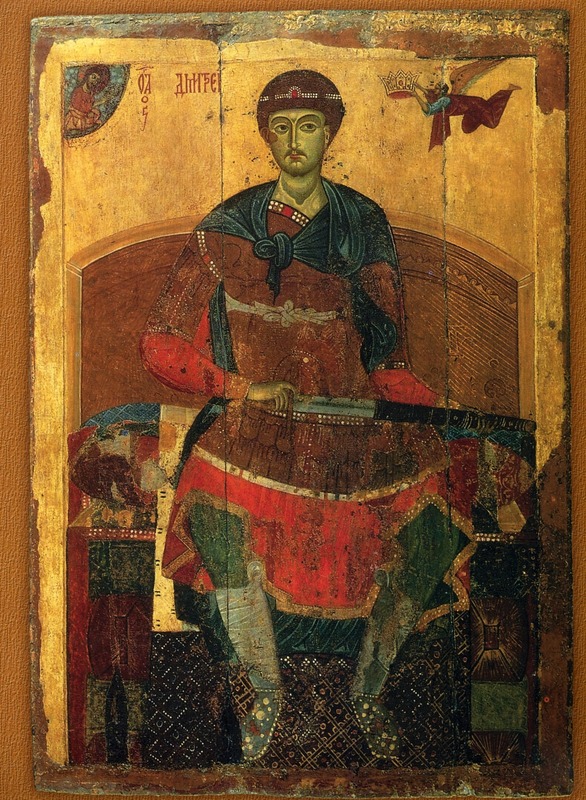 Ioannes Kameniates, who tells of the sack of Thessaloniki by the Saracens (904 AD) calls St. Demetrios the “Myrrh-streamer”. 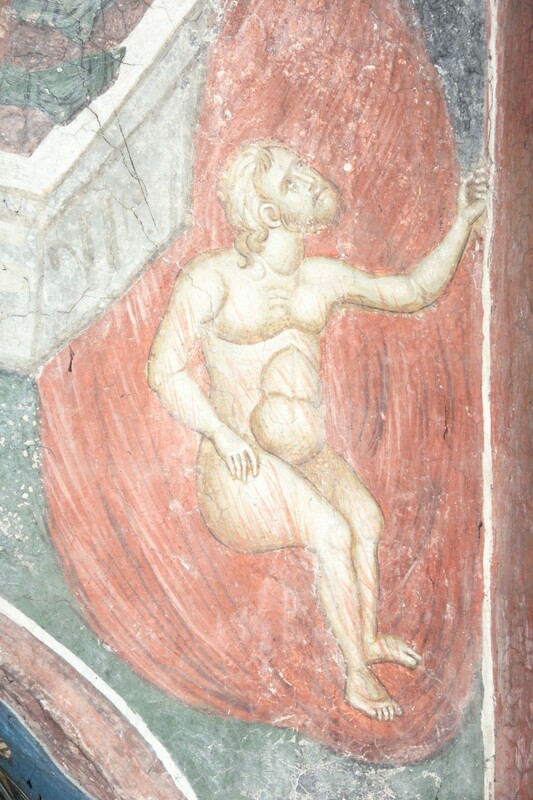 Konstantinos Akropolites (Great Writer, compiler of lives of Saints, rhetor and writer of letters) in 1321 AD, writes of a miracle of the Saint (healing of eyes), calling him the “Myrrh-streamer”. Isidoros (1342-1396) and Gabriel (1397-1416), Archbishops of Thessaloniki. The first calls the Saint “Myrrh-flower”, and the second, “Myrrh-streamer”. Epigraph from 1284 AD that was found in the Eski Serai mosque, speaks of the Church of St. Demetrios, saying: “there within is the great Myrrh-streamer”. The liturgical tradition and life of the Orthodox Church, after the 10th century, which, out of wonder and reverence, refers to St. Demetrios as the “Myrrh-streamer”. The witnesses to the myrrh of St. Demetrios are many, but great also is the grace which they received and continue to receive up till our days, as a sign of the blessing of the Myrrh. The wonders which the Saint works (both in the past and in our days) are many, and truly deep the gratitude of the faithful who are healed or helped in various ways. 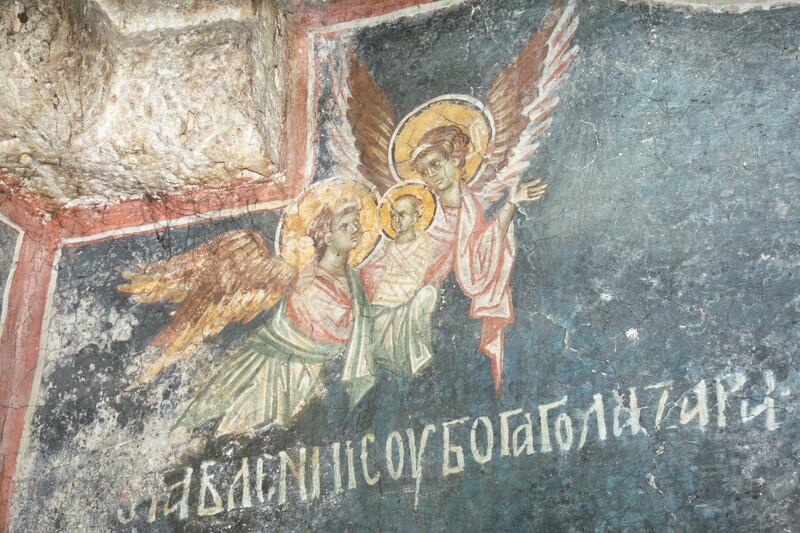 The Myrrh-streaming and Wonder-working St. Demetrios belongs not only to the God-preserved city of Thessaloniki, where his all-sacred Church is preserved, dating to the 5th century, but to the whole world, which honors and shows him reverence with moving deeds, here, and for 17 centuries. The Saint was imprisoned for around one year in a prison that was literally a cesspool! Waste was thrown in the place where the Saint was imprisoned. Does anyone then wonder why God granted him the grace of myrrh-streaming? ...Every year, roughly a week after the feast of the Saint, the priests, during a vespers service, open the reliquary to distribute the Myrrh to the world. One year, being an unbeliever, I went with my camera to the Church, and climbed the women's side of the church, standing so I could see what was going on. I began to record, and at one point, they opened the reliquary. There to my great astonishment I saw that the priests had another plexiglass inside that separated the Holy relics [holding them in place]. But what happened? I saw with my eyes and with my camera that whole reliquary (the chains, plexiglass, sidewalls) were covered with a coffee-colored liquid which filled the whole church with a beautiful fragrance. It was October 26th, 1987, at 10PM. Thessaloniki had celebrated the memory of the martyrdom of their protector, St. Demetrios, along with her liberation from around five hundred years of occupation by the Ottomans (1430-1912). The church of St. Demetrios with open doors received night time pilgrims who knelt before the silver reliquary with the holy relics of the Myrrhstreamer. That hour there mustn't have been more than thirty or forty people in the church. A band of about ten women, before the reliquary, chanted the Paraklesis of the Saint. The only cleric who was there was a young, newly-ordained deacon of the holy church with his diakonissa wife. The then Proistamenos [head priest] of the church was the current Metropolitan of Veria, Naouses and Kampanias Panteleimon, who had ordered him to stay there and wait. While the women were chanting the Paraklesis, they began to shout! The deacon ran close to them, and with mixed emotions they showed him the reliquary. It was literally bathed in an oily residue of myrrh (I saw myrrh because the fragrance was indescribable). It was as if someone had emptied at least two “buckets” of aromatic liquid (I use the word “buckets” so that you understand the quantity of the myrrh which poured down the sides of the silver reliquary with its relief icons of the Saint). The deacon was baffled at that instant: The Saint was flowing myrrh! Without at all doubting the miracle, and being found in a state of joy, astonishment and enthusiasm, he ran to bring cotton from the holy altar. He returned running, and began to soak up the myrrh with the cotton from the side walls of the reliquary to give portions to the pilgrims. Though he soaked up the myrrh, it didn't stop, but continued to pour forth mystically, without a source being seen. He was particularly struck by the following fact: with a large piece of cotton he soaked up the myrrh from a smooth area of the reliquary, which then appeared polished clean. A woman had touched the part that he had just cleaned, and he saw that her hand became soaked with the oily yellowish-green myrrh! In the mean time, the fragrance had filled the whole church, and poured forth from the open doors towards the road Agiou Demetriou, inviting passers-by to hasten to see what was happening, and where this fragrance was coming from. All those approached the reliquary where the relics of St. Demetrios were placed (they were not yet placed in the large reliquary that they are in today). These blessings, though astonishing, did not stop there! The pilgrims experienced that all of the icons of the church, wherever they were (either on veneration stands or the iconostasis) poured forth myrrh. In fact, the deacon saw pilgrims take out handkerchiefs to wipe the frames that protected the icons of the icon screen, and the handkerchiefs turned a yellow hue from the myrrh that ran from the two sides of the frame, the inner and outer. The magnitude of the miracle was so great that it left no one in doubt. We did not understand what we were experiencing, it was like a dream amidst fog, but we lived it! We touched it with our hands and saw it with our eyes, and sensed the fragrance in our nostrils! In a short while a line of people formed, with tears in their eyes, to venerate the reliquary of the Myrrh-streamer and they realized how he received this title. In the mean time, the Proistamenos and otherI priests reached the church. 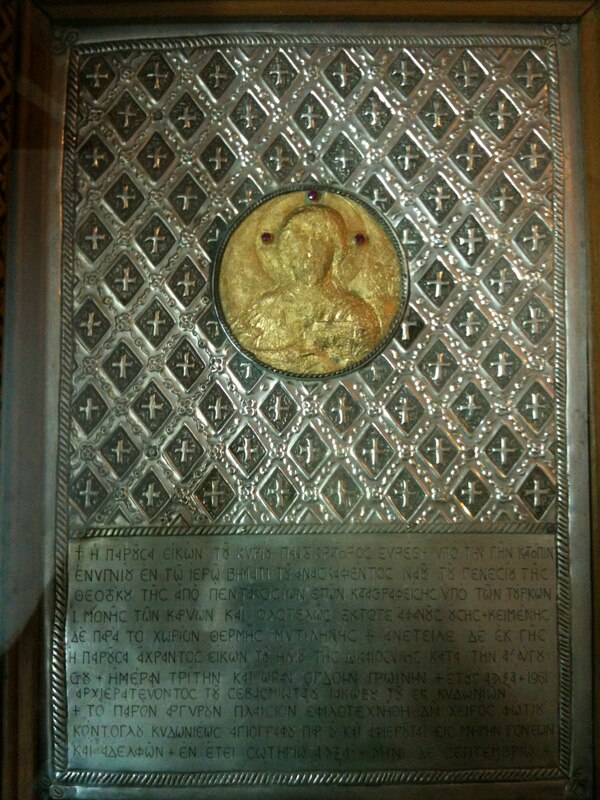 They unlocked the reliquary and opened the lid to reveal the holy relics of the Patron of Thessaloniki. They were fragrant, but the fragrance of the myrrh was different and characteristic. The blessed Metropolitan of Thessaloniki Panteleimon II Chrysaphakes ascribed the miracle of this myrrh-streaming of St. Demetrios to the following event: That evening in the festive celebration of the University for the liberation of Thessaloniki, the keynote speaker totally omitted the Saint, and didn't mention him at all. St. Demetrios, however, showed through his myrrh-streaming that he would never abandon the city of Thessaloniki neither now nor never, and that it was he who saved it from slavery and from earthquakes. Some, however, showed themselves ungrateful and distanced from Christ and His Saints. Twenty four years have passed since them. I was then the deacon of the church, now a priest in Thessaloniki, and I write you what I experienced as I remember. That time was as if I was living a mystery. I can't relate what I was feeling! Joy, astonishment, being moved, enthusiasm...I can't describe it fully. In any case, these are events that strengthen faith and fill us with joy, hope and the feeling of the presence of Christ and His Saints. Our faith is “alive”. Tone 4. By Andrew of Jerusalem. Let us all honour Demetrios, wisest in teachings and victor among Martyrs, who by lances inherited the grace from the Saviour’s side that was pierced by the lance, from which the Saviour pours out for us streams of life and incorruption. Through blood he finished the course of his contest and shone for all the inhabited world by wonders, zealous for the Master and compassionate lover of the poor; many times the defender of the people of Thessalonika in many dread dangers. As we celebrate his yearly memorial, we glorify Christ God, who works through him healings for all. The love and devotion towards St. Demetrios the Great Martyr and Myrrh-streamer from the Orthodox faithful of Thessaloniki is truly immense. Though to some it may seem hyperbolic, St. Demetrios has worked countless wonders both for the city of Thessaloniki, and for all the Orthodox faithful throughout the world. In praise of Christ Who strengthened him in his martyrdom, and in honor and thanksgiving to this great Wonderworker, various hymnographers have composed hymns beyond those of the standard Menaia in praise of St. Demetrios. Many of these hymns comprise the so-called "Holy Week of St. Demetrios". This is a collection of pre-festal hymns from various sources in honor of the Saint, and are generally modelled after and grouped correspondingly to the days of Holy Week (i.e. the Passion and Resurrection of Christ). 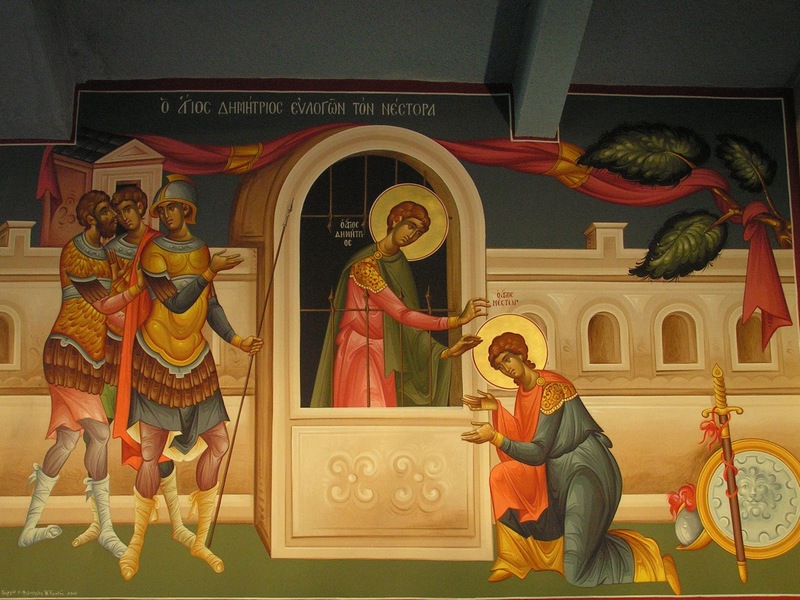 Thus, they begin on October 19th ("Palm Sunday") and proceed to the feast of St. Demetrios on October 26th ("Pascha"). Many of the hymns have been written by St. Symeon of Thessaloniki (+1429), so we can see how this is an old and established tradition of this local Orthodox Church. 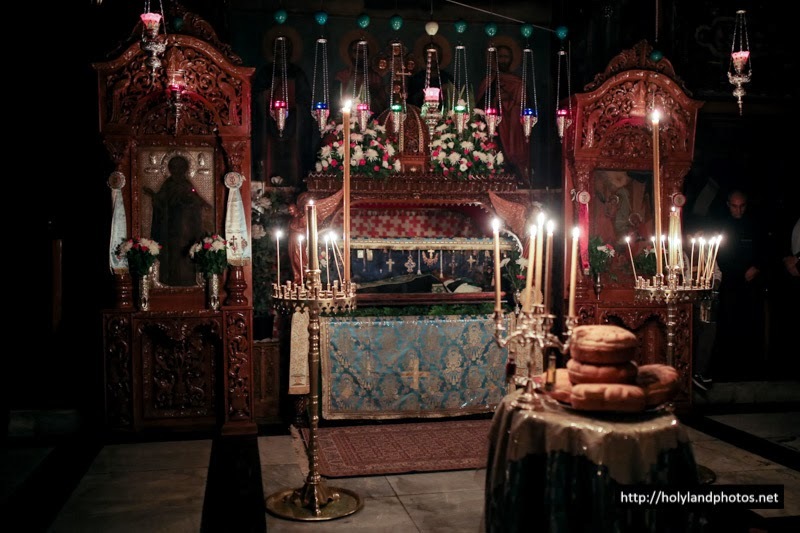 The full services for the Holy Week of St. Demetrios (in Greek) are available online here: http://analogion.com/forum/showthread.php?t=14355. Below are amateur translations of a few hymns from the Holy Week of St. Demetrios. They are beautiful, compunctionate and theological works by two Fathers of our Church, in praise of such a great role model and servant of Christ, St. Demetrios. May he intercede for us all, and heal us of the passions of body and soul! Before the days of your passion, the champion being in prison, the holy Nestor approached him and said to him: “O glorious one, how will I be able to conquer the terrible Lyaios?” He encouraged him, saying: “Go to that stadium, and you will find me fighting with you, interceding for you to the Lord, and make the sign of the cross, and in the midst of the battle cry: O God of Demetrios help me! And you will break him and throw him down. 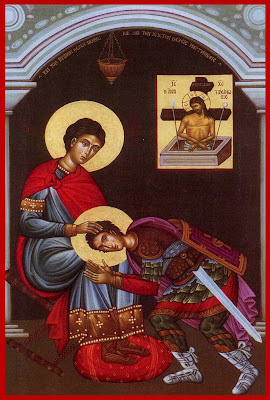 As a second Jacob, you wrestled with your enemy, and as the chaste Joseph who ruled over the passions, we honor you, for you O martyr were not a slave to sin or to error, and you, O blessed one Demetrios, received grace for your struggle and an incorruptible crown. Your nous trampled upon the enemies, and all of their deceits you dissolved, and you were granted victory from above, O most-praised Martyrs, and cry out together: How good and pleasant it is to be numbered with Christ. In the heavens, O Christ, dwell Demetrios and Nestor, and they are arrayed by you in divine light. Hasten speedily to me, who walk in the darkness of ignorance, to heal the passions, O only Immortal One, and grant me the garment of incorruption, that being arrayed in white, I might praise their light-bearing feast, and cry to You, O Lord: How good and pleasant it is to be numbered with Christ. Victory-bearing champion of the Immortal Master, mighty soldier of the King of Glory, O Demetrios, we the faithful praise you, saying: You have done well, to grant life everlasting. 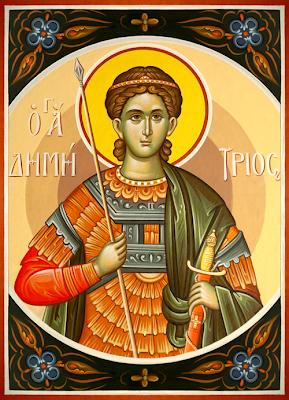 Which should I hymn, O martyr Demetrios? Your pre-struggles? Your struggles? Your post-struggles? All three I am compelled to praise. First, your pure way of life, second, your struggles, third, your many miracles which you have worked and continue to work from your tomb. Therefore, each of the faithful approaches your living relic in faith, reaping as from Paradise, life everlasting. Your name is wondrous through all the earth, for the grandeur of your miracles has reached the heavens above. I sing to you at this time with the instrument of David, for you imitated the God-man Word of the all-exalted Father, as His close servant. For though you did not ascend the cross, your most clean body was pierced, and was shown forth as consumed. The side of the Savior, which was fearsomely pierced, made passage for the noble and godly-wise thief. Because of thus, your name is wondrous through all the earth, and the greatness of your glory is magnified from the ends of the world. Therefore, protecting your mother land, you look upon the Thessalonians, and they are sheltered by you from all types of continuous trials. Desiring Christ, the incorrupt and living, you were run through with spears and killed, and thrown in a well, and were not buried, not being granted your holy tomb. You poured forth myrrh, and grant grace to those who cry out: This is the body of the all-pure Demetrios, in whom Christ was glorified, Who lives, having risen on the third day. When He Who holds all things in His palm was crucified, creation praised Him. 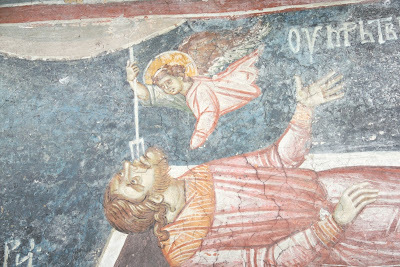 When this zealous Demetrios was crucified by spears, and in eros stretched out his hands, and accepted piercing in his side, he was rendered as dead, and consigned to the well, and as the sea poured forth a never-emptying river of myrrh, and granted streams of wonders, healing the souls and bodies of many, and put to end all error, and Lyaios is shamed, and with Christ who granted myrrh to the faithful, we cry out: This is the body of the all-pure Demetrios, in whom Christ was glorified, Who lives, having risen on the third day. Ode I of the Canon in the First Tone. 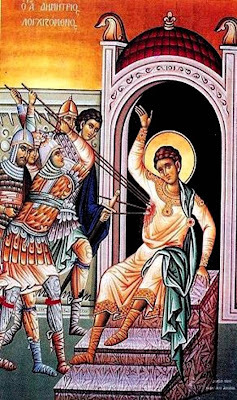 It is the day of resurrection, the slaughter of Demetrios, for the error falls, and the Church of Christ is radiantly resurrected, and greets in joy, and cries out to God a joyous ode. Let us all purify ourselves, and gather, arrayed in white, at the relics of Demetrios, which shine. And beholding them as we have heard, to the martyr let us say: Rejoice. Truly the heavens decleare the glory of God, and the faithful glorify the work of His hands, the firmament hymns the martyr, the work of the hands of God, and because of this rejoices. 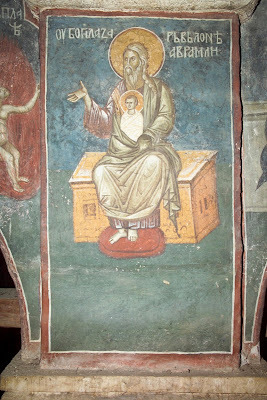 "This icon of the Lord Pantocrator was found in the earth immediately before the holy bema of the uncovered Church of the Nativity of the Theotokos, 500 years after the Turks destroyed the Holy Monastery of Kayres and from that time was totally unknown. This spotless icon of the Sun of Righteousness therefore was uncovered from the earth on the first of August, Tuesday, at 8 AM, in the year 1961, while the Hierarch was the Most-revered Bishop Iakovos of Kydonion. 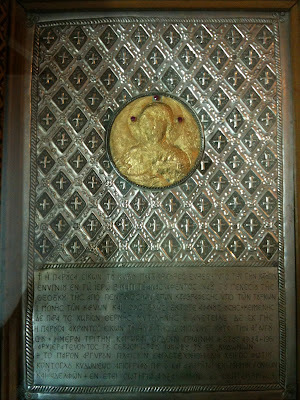 This silver covering was created through the hand of Photios Kontoglou of Kydonies, the Iconographer, who offers it in memory of his parents and siblings..."
About ten years ago, Michael had become a Roman Catholic priest somewhere in Germany, and his life of agony and doubt was dedicated to the search for the Truth. This however was the good doubt that is blessed by the God of Truth. His name had changed, and as a Catholic priest he was named Maximilian. However, his question overcame the joy of the priesthood, something that would not let him find peace, that made him feel that something was wholly missing within him, despite the fact that he had fulfilled his desire to become a priest of Christ. A continuous study of the Fathers with very fervent prayers began to create within him the glorious feeling that the Truth is not far from him, and that God would show him information from above! Orthodoxy began to sweeten him and to lead him from within to read the Orthodox Fathers. He sensed that the secret he was looking for his whole life with such fervor was hidden there and was calling him. But with what power could he make this great return? How could he inform the wayward Roman Catholic Bishop of his return? How could he tell his parish, which he loved so much and had so much faith in him? Thus amidst this difficult situation, with childlike innocence, he entreated God in prayer to give him strength, to console him as He knows so beautifully, and to lead him to Orthodoxy. In addition, he asked God to show him an Orthodox Saint that he could have as a protector in this difficult decision of his life. He knew well from his studies, as Maximilian told us, that Saints like these do not exist in Catholicism, and the Protestants don't have Saints, thus they must be Orthodox. And he bought the icon, full of joy that God had heard his prayer and sent him Orthodox Saints to help him in his return, though he didn't know anything about them, and in German there were not many books about Orthodox Saints! Thus he was left with his question and his prayer that help from above might continue unabated, that he might find the courage to make the decision to return. After about three weeks, he went to another city for work, and visited a Uniate bookstore to buy a book. While there, before him he saw a red book in German with a strange title: The Life from the Tomb. He browsed through it briefly and saw that it had to do with martyrs, a topic that was important to him, so be bought it. That night, he quickly glanced through the book, and again found it interesting. The next morning when he awoke, he decided to read this book more systematically, and as he turned through the pages, his eyes fell on the icon that he had recently bought from the Catholic bookstore: Sts. Raphael, Nicholas and Irene. It was July 3rd, the day when the relics of St. Raphael were uncovered...Up till that time, roughly all the important events of his life had occurred on July 3rd, without him knowing anything about it. Later after much effort, he was able to visit Greece, and he had in his head to go venerate and fervently thank the Saints in Mytilene before he began his new life as an Orthodox Christian. Thus he went to the monastery and began his monastic life, where he learned that in a few days, there would be an organized pilgrimage to the Saints. Thus his obedience won out, and he made the pilgrimage with much joy. After about five years, the Catholic Michael had become [an Orthodox] hieromonk and spiritual father, bearing the name of a great contemporary Saint, and he rejoices greatly that as spiritual children, he had certain Germans who had formerly been his parishioners, including the sweet Irene, who was one of his first three baptisms that he had performed as an Orthodox priest, and whom he dedicated to the Saints, thus naming her Irene. The other two that he baptized should be self evident: Raphael and Nicholas! And the story of Irene is wondrous: a traditional Catholic girl with a terrible struggle in her life. However, her courage for many years, her agony, her psychological stress, her being abandoned of all love and consolation from her spouse and children led her as natural to medicines for consolation for many years. Our good God, who seems sometimes to delay but never forgets, brought about the resurrection of Irene, rewarding her incomparable patience. The priest of her parish, Fr. Maximilian, helped her to flee and to change the dogma of her faith. And the miracle occurred. The day of her baptism, Divine Grace dispelled the fatigue of her life. She forgot her difficult and torturous husband and cleansed her subconscious, and she threw away her medicines. Today, she shines as does Orthodoxy. She has served for 75 years her unbearable and even more difficult husband and her wayward children. However, her joy is to go to Greece to go to the monastery of her repentance and to sense the divine consolation she experiences with the continuous Divine Communion, which strengthens her in her homeland, due to her great distance from the nearest Orthodox church. Glory to God for all things, through the prayers of our Saints Raphael, Nicholas and Irene. 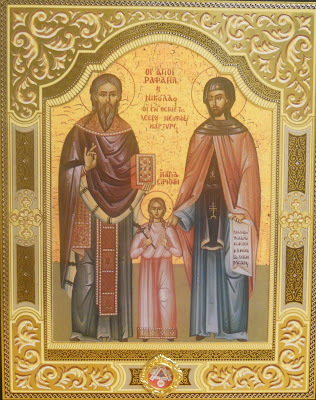 Note: In this selection, we see both the historical and spiritual importance of the Divine Liturgy of St. James (Iakovos) Adelphotheos, and the Divine Illumination that underlined the composition of the Divine Liturgy of St. Basil the Great. It is important to keep in mind that this in no way demeans the ancient and compunctionate Liturgy of St. James, which many Orthodox Churches still celebrate to this day (on St. James' Feast on October 23, or on other days). In addition, it is important to know that this does not justify just any change to the holy services of the Orthodox Church. St. Basil, one of the greatest Fathers of the Church, had the wisdom, discernment, and divine guidance to know when alterations were necessary to the Divine Liturgy. To this day, there seem to be no grounds for further alterations to the timeless, heavenly and soul-saving Divine Liturgies of the Orthodox Church. 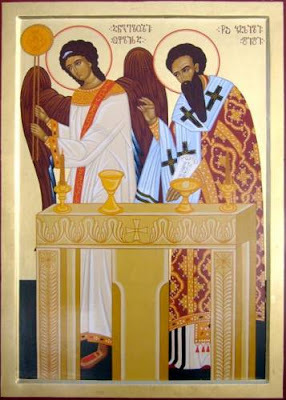 According to the tradition of the Orthodox Church, three of the old Divine Liturgies include that of the Apostle James, that of Basil the Great of Asia Minor, and that of John Chrysostom of Constantinople. 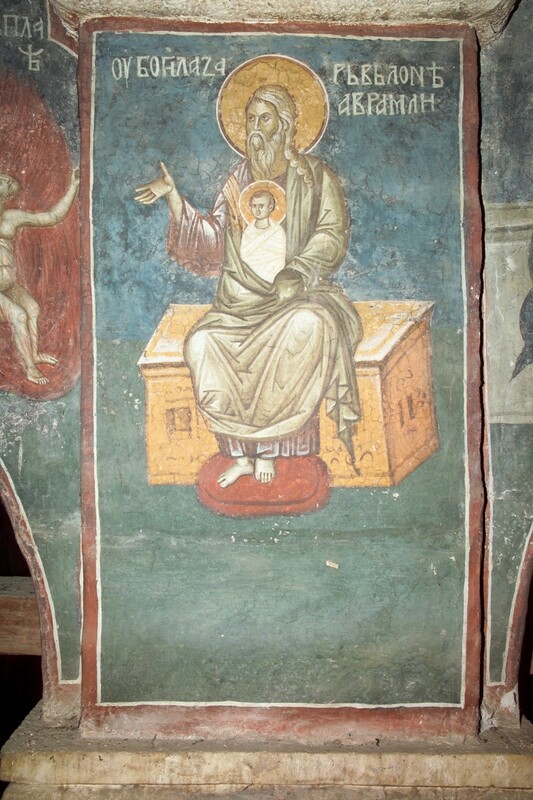 After the Resurrection of Christ, St. James, the son of Joseph the Betrothed, the so-called "Adelphotheos" ["Brother of God"], became the Archpriest of the faithful of Jerusalem, and wrote in Hebrew certain prayers and entreaties to God to be said by the Priests when they would celebrate the Divine Mystagogy, which was granted by our Lord Jesus Christ to the Apostles on that night that he was betrayed. Those prayers and the service of the Divine Liturgy were translated into Greek, as they are found today. St. Clement, the disciple of the Holy Apostle Peter whom he appointed Pope of Rome, advised all Christians to celebrate the Divine Mystagogy in this manner. In this way, therefore, the Christians celebrated the Divine Liturgy for 350 years. However, those prayers and the Service was very long. The Priests neglected the service and did not liturgize, while the Christians during the Liturgy grew tired and yawned, as they wanted to go to their homes and to their jobs. Thus St. Basil the Great saw this situation, and hoped in some way to ease the great burdens of the Christians, while also trying to find time to expand his teaching. He asked God to show him a sign that he might know if it was His will to complete his task [i.e. to write an shorter Divine Liturgy]. Thus he prayed for many days with fasting and tears. One night, he saw a wondrous and paradoxical vision, which he was made worthy of due to his purity and holiness, and which I am afraid to relate, O blessed Christians, being myself unworthy and full of all uncleanliness. Therefore in this vision, St. 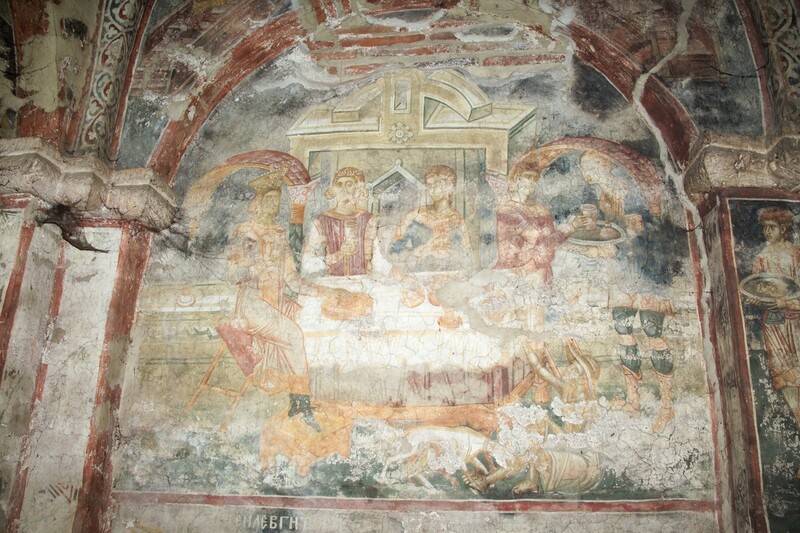 Basil saw Christ with the Apostles (O Your condescension, O Lord Who loves mankind!) and according to the archpriestly order He celebrated the Divine Mystagogy with them. However, the Lord did not say the prayers as written in the Liturgy of the Brother of God James, but He shortened them in the manner in which St. Basil later composed his Divine Liturgy. The Saint, having seen this vision, thanked God Who hearkened to his prayer, and he wrote the Divine Liturgy in a more condensed fasion, as it is found today.